Sausage “Cookies” are an easy breakfast idea using Jimmy Dean Premium Pork Sausage. 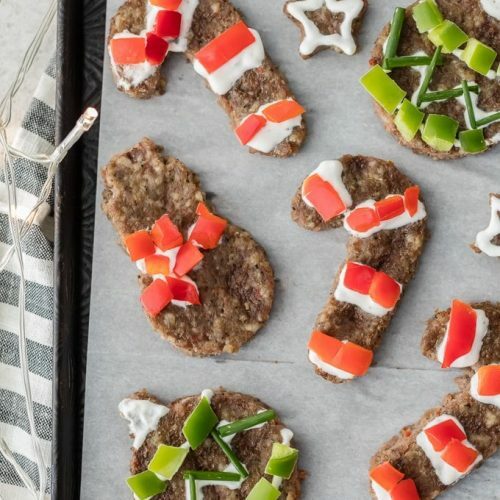 The festively shaped pork patties make Christmas morning breakfast fun, delicious, and hearty! Kids will love making and decorating their breakfast for their favorite holiday! Garnishes such as hot sauce sour cream, cheese, red pepper, green pepper, chives, or whatever you like! Remove sausage from roll and flatten onto a large sheet of parchment or plastic wrap. Top sausage with second piece of parchment paper. Roll sausage evenly to about 1/4-inch thickness. Remove the top piece of parchment. Cook sausage in oven for 20 minutes or until browned and cook through. Use your favorite holiday cookie cutters to cut our your shapes.